Lincoln Corporation No 23 was the first to be completed of a batch of ten Guy Arabs purchased by Lincoln Corporation in 1948, and was exhibited by Guy Motors at the 1948 Earls Court Commercial Show. The bodywork on this batch was built by Guy using Park Royal components, and they were new in the livery currently worn by No. 64, with a single cream band between decks. No. 23, unlike the others in the batch which had Gardner 6LW engines, was fitted with a Meadows 10.35 litre engine. No. 23 also had a number of experimental features including a detector on the platform handrails designed to show a warning light to the driver if a passenger was being dragged along behind the bus (this feature was not a success), and an indicator light to remind the driver if a passenger had rung the bell for the next stop (this feature started to become standard on buses in the late 1990s - on modern buses it is reset by the doors opening, but on No. 23, the driver had to remember to cancel it on arrival at the stop - hence the provision of what appears to be a bell-push in the driver's cab.) These features were designed by Mr George Rock, then the general manager, and the special wiring was produced locally by Jointine Products. In 1953, No. 23 received a second replacement engine, its Meadows 6DC already having been replaced by a Meadows E120 unit. Its new Leyland 8.6 litre unit required the radiator to be moved forward slightly. A revised livery with a second cream band, below the lower saloon windows, was received around this time. No. 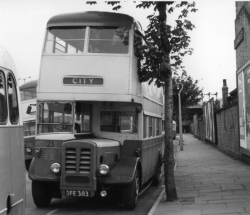 23 was taken out of service in 1959 following a further engine failure, and after a period in store, returned to service in 1961 in the brighter livery (that it now carries) that had been introduced from the late 50s. A more significant change was its fitting with an air cooled engine from local engineering company Ruston & Hornsby - this was a development of a successful marine engine, which was fitted experimentally to a small number of buses in the early 60s. No. 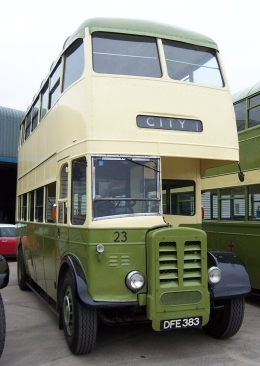 23 in service, in post 1953 livery, and with Leyland engine. (LVVS collection) No. 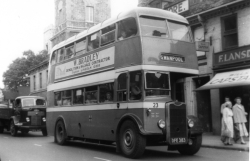 23 in service, in 1960s livery, with Ruston Hornsby engine. (LVVS collection) No. 23 at Lincolnshire Show ground, 1968, in LVVS blue / red livery. Lincoln 23 in action on the 'twilight tour' at our November 2010 Open Day event - video by d33206hg on Youtube. 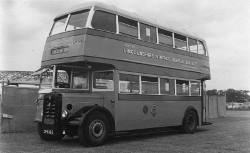 Withdrawn from service in 1967, it was presented in 1968 to the Society by Ruston and Hornsby, and for some years, the bus carried the Society's blue and red colours, prior to restoration to its 1961 livery - complete with correct exterior advertisements that were applied in 2004 following a grant from Lincolnshire County Council's Heritage Fund. A 1968 colour picture of No. 23 in blue livery can be seen on John Law's Flickr page - here. No. 23 retains some original interior advertisements. Both Bycrofts Emporium and the (old) Odeon Cinema are no longer in the High Street. An 'honesty box' for uncollected fares was fitted to the platforms of LCT's buses. This sign - complete with 1950s style traffic lights and signs - was fitted to all LCT buses, including those with doors, into the 1980s. July 2008 - Rear hub inspection and handbrake mechanism work is being carried out. January 2009 - Recent work has included a rear axle brake service and work on the differential seal. Several seats are also being reupholstered. April 2009 - The nearside rear brake has been stripped and serviced; the offside rear brake serviced. The steering box, king pins and steering joints have all been checked, the pinion oil seal changed and new oil added. The speedo has been removed and repaired, and a new dip switch fitted. The reupholstered seats have been fitted, and some exterior paintwork has been refreshed. Following an MOT pass on 28 February, the bus returned to 'service' at our Easter Open Day. 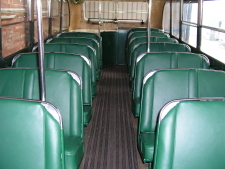 July 2009 - The upper deck now has a full set of reupholstered seats complete with newly manufactured 'grab' plates; and lovely it looks too! January 2010 - The windscreen rubber surrounds have been replaced and a puncture repaired. July 2011 - A few rubber floor strips have been replaced. October 2012 - Dave B and Daryl have checked over the front brakes. January 2014 - The drivers seat has been reupholstered. April 2016 - The steering box is being re-bushed to try and make the steering less heavy. July 2016 - No. 23 has had a replacement steering box fitted and it seems lighter now. January 2017 - No. 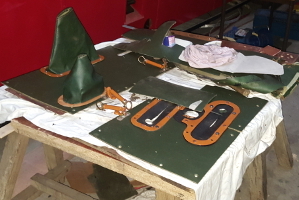 23 is undergoing a long running repair to its manifold - while it is out of action, the opportunity has been taken to refurbish the cab interior. July 2018 - Number 23's engine is back in place after a complicated rebuild.